More Clone Wars! 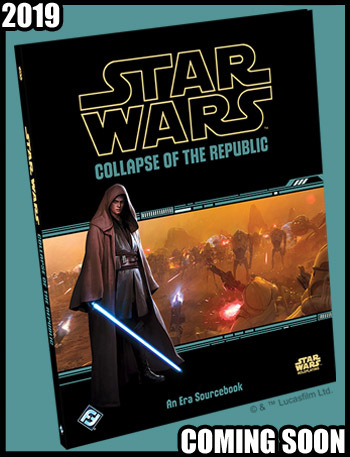 Fantasy Flight Games announced the upcoming release of Collapse of the Republic, a new era sourecebook that follows up on the previously announced Rise of the Separatists (also coming soon). I worked on both books. 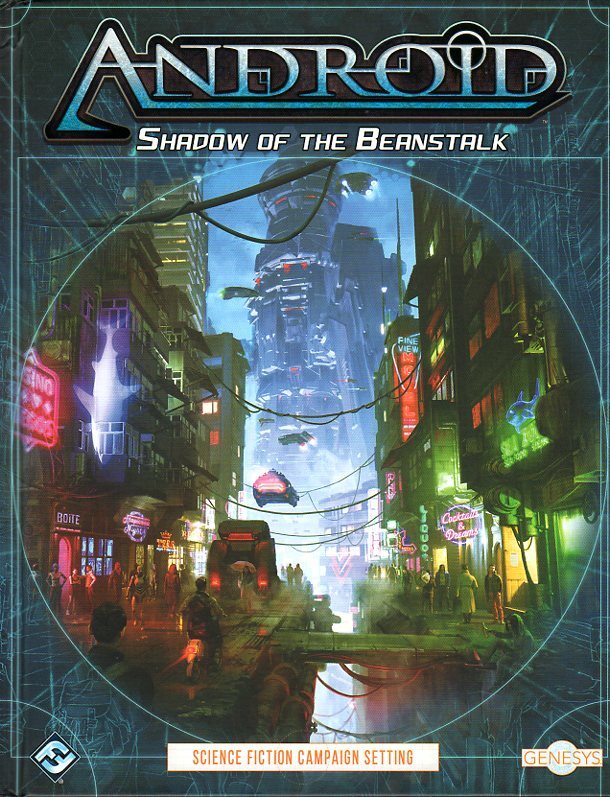 This book works with all three RPG core rulebooks - Edge of the Empire, Age of Rebellion, and Force and Destiny. 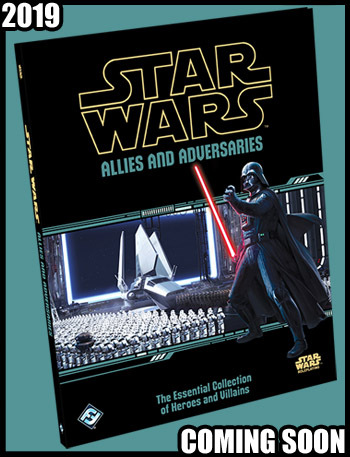 Fantasy Flight Games announced the upcoming Star Wars Age/Edge/F&D supplement Allies and Adversaries, The Essential Collection of Heroes and Villains. So, plenty of NPCs and stat blocks for Star Wars RPG campaigns. Use them as the characters they are, or modify for your own games. I worked on it. It’s scheduled for release in the second quarter this year. 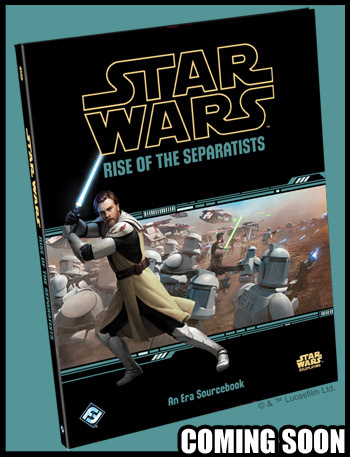 Fantasy Flight Games announced the latest Era sourcebook for the Star Wars RPGs: Rise of the Separatists. It brings the Clone Wars and specifically The Clone Wars animated series to the RPG, and can be used with any or all of the existing core rulebooks. I worked on the product. It features, for the first time, the Jedi career, as well as clone specific careers. As usual, it also features four new species, and other era specific resources. The rather inaccurately named DMs Day Sale at Dungeon Masters Guild and Drive Thru RPG is on, and runs thru March 11th (so, DMs Week). Most of my offerings are available at a discount. If you use the links below or on my Storefront page to purchase items, I get also a small affiliate credit. Thanks. Many of the D&D 4e products I worked on are also on sale. See my Storefront page for direct links. As a side note, I just realized that The Game Mechanics pdfs are no longer available. I'm happy to announce the release of Roaming Chult, my latest DM's Guild product for Dungeons and Dragons (5e). Roaming Chult is a collection of new items and resources for players and Dungeon Masters playing in Chult for Tomb of Annihilation campaigns or other jungle adventures. 100 New trinkets, inspiried by Chult, its people, and its adventursome visitors. 5 New backgrounds for PCs from Chult (great options for mid-campaign replacement characters). 9 New magic items of the trickster gods, with powers and hinderances reflecting each of their personailties and motives. 20 New magic items of the denizens of Chult. Expedition Log for tracking exploration progress and basic supplies through the jungles (or any campaign). Print and fill out at the table during the game. Also PDF form fillable. For DM or player use. Expedition Journal Pages for DM handouts or player journals and notes. One is ruled, the other features a grid for maps and sketches. Print and use at the table. Both are also PDF form fillable. The PDF file has printer friendly pages, except for the Log and Journal Pages, which are full page color. The wait is over. The boat has arrived. 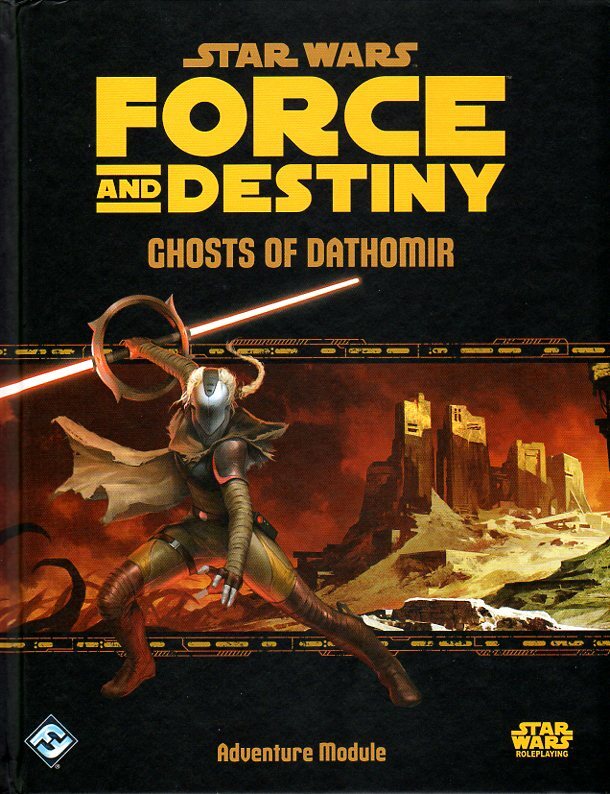 Star Wars Force and Destiny Ghosts of Dathomir officially released today! Find it at your local game stores, major retailers, and online. It's been a longer than anticipated wait, but hopefully everyone will find it to be worth it. Explore unusual and dangerous locations against a variety of foes and a top notch villain. There is a lot of room for GM/party background connections and customization, as desired. Today, Fantasy Flight Games announced a new type of product for the Star Wars RPGs line. Star Wars Dawn of Rebellion is an Era sourcebook, the first RPG book for use with any of the three Star Wars RPG game lines - Edge of the Empire, Age of Rebellion, and/or Force and Destiny. It features the Rebels TV show and Rouge One. I'm one of the writers. It's a fourth quarter 2017 release. 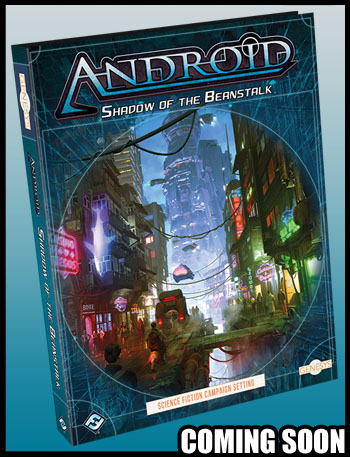 Fantasy Flight Games announced Star Wars Age of Rebellion Cyphers and Masks late last week. Since I ignored twitter most of the weekend, I didn't catch it until now thanks to today's announcement (see next post). Cyphers and Masks is the spy sourcebook, and I'm one of the writers. It is due to be released fourth quarter of this year. Today, Fantasy Flight Games announced the new Genesys The Roleplaying Game for All Settings, bringing the narrative dice system from the Star Wars Edge/Age/Force RPGs to any RPG setting. I was one of the writers on the Core Rulebook. 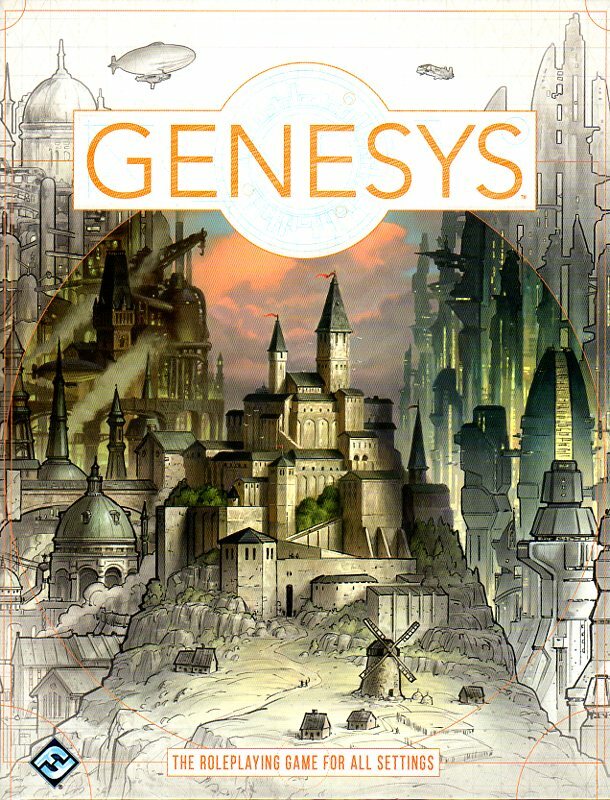 Genesys is based on the Star Wars system, but it has elements all its own as well. The dice have new symbols, but they're not too different. Basically stars are good, Xs are bad. The colors, dice names, and symbol names remain the same as their Star Wars versions. The book comes ready with five different RPG settings covering multiple genres. Genesys is due for release in 4th Quarter this year. With Gen Con 50's advance event schedule going live and wish lists available, I'm happy to announce the "30 Years of Star Wars Roleplaying Games" event, with myself, Sam Stewart of Fantasy Flight Games, and Bill Slavicsek formerly of West End Games and Wizards of the Coast. Fantasy Flight Games is generously sponsoring the event. It is part retrospective, part panel discussion about 30 years worth of roleplaying in a galaxy far, far away across multiple companies and game systems, featuring some of the designers involved. Join us at GenCon on Saturday 8/19/17 in Westin Capitol III at 5:00pm (Gen Con Game ID SEM17112485). Things are still developing, so click here for the latest updates. Star Wars Edge of the Empire Special Modifications, a sourcebook for Technicians, is nominated for a 2017 Origins Award in the RPG category. I was one of the writers. It's an honor to be considered in what is a highly competitive category with a lot of great RPG products. The Star Wars The Force Awakens RPG Beginner Game is also nominated in the same category. The complete list of Origins Awards nominees is here.